Each spinal nerve is formed from the combination of nerve fibers from its posterior and anterior roots. The posterior root is the afferent sensory root and carries sensory information to the brain. 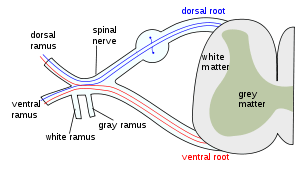 The anterior root is the efferent motor root and carries motor information from the brain. 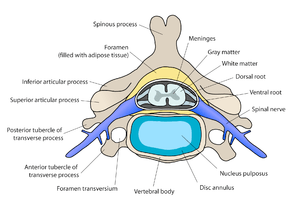 The spinal nerve emerges from the spinal column through an opening (intervertebral foramen) between adjacent vertebrae. This is true for all spinal nerves except for the first spinal nerve pair (C1), which emerges between the occipital bone and the atlas (the first vertebra). Thus the cervical nerves are numbered by the vertebra below, except spinal nerve C8, which exists below vertebra C7 and above vertebra T1. 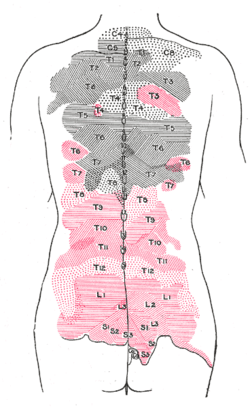 The thoracic, lumbar, and sacral nerves are then numbered by the vertebra above. In the case of a lumbarized S1 vertebra (aka L6) or a sacralized L5 vertebra, the nerves are typically still counted to L5 and the next nerve is S1. 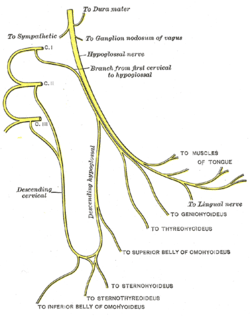 Outside the vertebral column, the nerve divides into branches. The posterior ramus contains nerves that serve the posterior portions of the trunk carrying visceral motor, somatic motor, and somatic sensory information to and from the skin and muscles of the back (epaxial muscles). The anterior ramus contains nerves that serve the remaining anterior parts of the trunk and the upper and lower limbs (hypaxial muscles) carrying visceral motor, somatic motor, and sensory information to and from the ventrolateral body surface, structures in the body wall, and the limbs. The meningeal branches (recurrent meningeal or sinuvertebral nerves) branch from the spinal nerve and re-enter the intervertebral foramen to serve the ligaments, dura, blood vessels, intervertebral discs, facet joints, and periosteum of the vertebrae. The rami communicantes contain autonomic nerves that serve visceral functions carrying visceral motor and sensory information to and from the visceral organs. 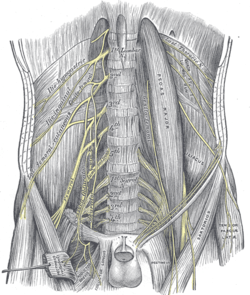 Some anterior rami merge with adjacent posterior rami to form a nerve plexus, a network of interconnecting nerves. Nerves emerging from a plexus contain fibers from various spinal nerves, which are now carried together to some target location. 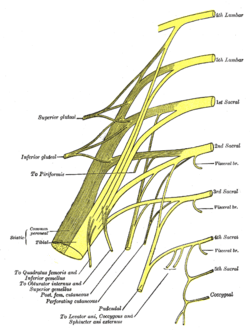 Major plexuses include the cervical, brachial, lumbar, and sacral plexuses. The cervical nerves are the spinal nerves from the cervical vertebrae. Although there are seven cervical vertebrae (C1-C7), there are eight cervical nerves C1–C8. All cervical nerves except C8 emerge above their corresponding vertebrae, while the C8 nerve emerges below the C7 vertebra. 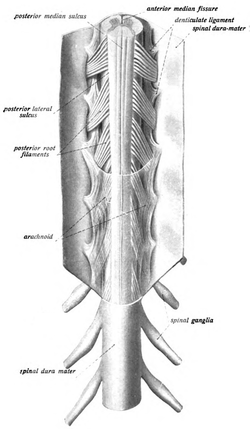 Elsewhere in the spine, the nerve emerges below the vertebra with the same name. ↑ "Spinal Nerves". National Library of Medicine. Retrieved 12 April 2014.